Pain in the knee joint can negatively impact the knee’s range of motion and mobility. Knee replacement surgery is a knee surgery that can remove an arthritic or damaged knee joint and replace it with an artificial knee prosthetic. Knee surgery can help you regain knee mobility and decrease knee pain caused by an arthritic knee joint. The knee is where the bone of the thigh (femur) meets with the bone of the shin (tibia). Articular cartilage encases the ends of the femur and tibia. The articular cartilage allows these bones to gently glide across one another without irritation. The articular cartilage is slick due to joint fluid produced by the knee joint’s lining. This joint fluid is encased in a soft tissue known as the joint capsule. The kneecap, which is also referred to as the patella, is the bone at the front of the knee. The kneecap is encased by a tendon, which connects the quadriceps to the tibia. The back portion of the kneecap is lined with articular cartilage to reduce irritation from the femur and patella. What can knee surgeons achieve with a total knee replacement? Knee arthroplasty can remove and replace an arthritic knee joint and restore a proper range of motion. Total knee replacement surgery can also reduce the friction of the knee bones grinding against one another, which can cause discomfort and pain. Knee arthroplasty can help patients return to everyday activity and reduce knee pain. What should I expect before knee replacement surgery? Prior to knee arthroplasty, you will need to undergo a physical examination to ensure that you are a proper candidate for total knee replacement. You may also meet with your physical therapist before knee arthroplasty to discuss what exercises you may be doing after your knee surgery. Additionally, the information gained from this initial visit with your physical therapist can be used for comparison to see how well you progress during physical therapy after knee replacement surgery. Your physical therapist may take note of your range of mobility or any pain and inflammation around the knee. You may also practice using crutches or a walker prior to knee surgery, as you will need assistance walking as you initially recover from knee arthroplasty. What should I expect during knee arthroplasty? Knee surgeons may perform knee replacement surgery using a cemented technique or uncemented technique. It is also possible that Dr. Rozbruch may use a combination of these techniques. A cemented technique uses a medical cement to secure the knee prosthetic. An uncemented technique uses a mesh material that promotes bone growth. Dr. Rozbruch can help you decide if a cemented or uncemented technique for knee replacement surgery is right for you. Each knee prosthetic is comprised of 3 parts, including the tibial component, femoral component, and patellar component. The tibial component replaces the top portion of the bone below the kneecap (tibia). The femoral component replaces the bottom of the bone above the kneecap (femur). The patellar component substitutes the kneecap itself (patella). The femoral component is made of metal. The patellar component may be made out of plastic or metal and plastic. 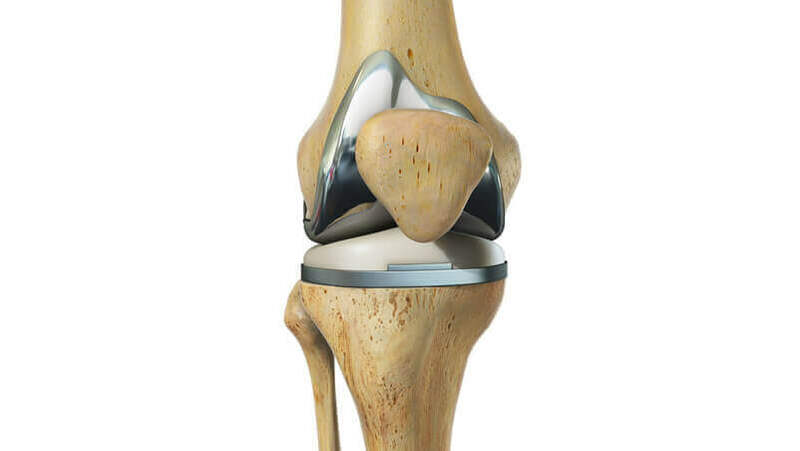 The tibial component is often made of 2 parts, which include a metal tray and plastic spacer that will provide a smooth exterior. 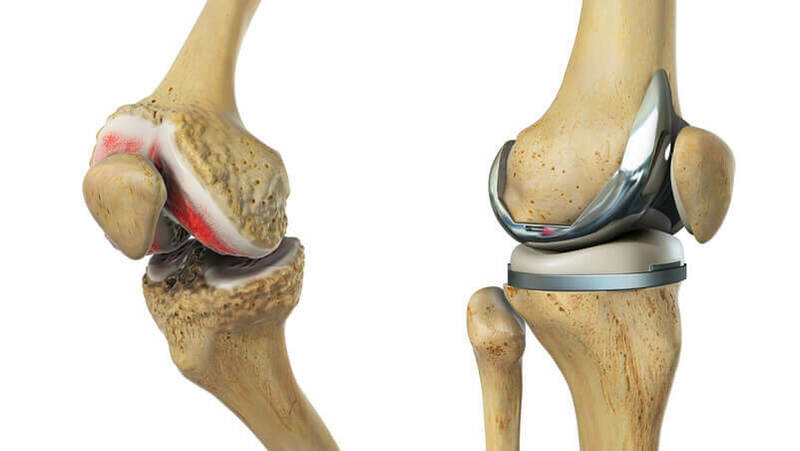 To begin your knee replacement surgery, an incision at the front of the knee will be placed. Once the knee joint can be accessed, Dr. Rozbruch will use a positioning device that will be placed at the end of the femur. This positioning device will act as a guide to ensure that Dr. Rozbruch is able to cut any bone at a proper angle. Several small fragments at the end of the femur will be removed and be replaced with the metal prosthetic. The tibia is then prepared to receive the tibial component. Another guide will be used on the tibia to ensure correct alignment of the knee prosthetics. The articular surface of the knee will then be removed. Dr. Rozbruch will then place the femoral component on the femur. During an uncemented knee replacement, the femoral component will be secured by being placed within the end of the femur. A medical cement is used during a cemented knee replacement to hold the femoral component in place. The metal tray of the tibial component that holds the plastic spacer will be placed on the top of the tibia. This metal tray will either be secured through cementing or screws depending upon which knee arthroplasty technique is used. The spacer will then be secured to the metal try. One of the final steps of total knee replacement involves sizing and placing the patellar component behind the patella. The patellar component is typically cemented into place. At the end of knee arthroplasty, the incision will be closed either with stitches or metal staples. Does Dr. Rozbruch offer revision knee replacement? Yes, Dr. Rozbruch does offer revision knee replacement surgery to help correct complications from previous knee arthroplasty. If you have undergone knee arthroplasty with a less skilled knee surgeon, you may experience discomfort and limited mobility of the leg. Dr. Rozbruch can correct knee replacement complications and replace an unsuccessful knee prosthetic with a new artificial knee joint. With time, an artificial knee joint may begin to experience wear and tear, especially in younger patients with an active lifestyle. If a knee prosthetic degenerates to the point where you experience knee pain or limited mobility, you may require revision knee replacement surgery to replace the worn artificial knee joint. Special devices known as continuous passive motion machines may be used following knee replacement surgery. Continuous passive motion devices help to manipulate and move the leg without straining the healing knee. Movement shortly after knee surgery can reduce the possibility of blood clots forming. Your leg may also be elevated to help drain any excess fluid from the knee. Physical therapy sessions will occur 1-2 times daily as long as you are staying in the hospital. Physical therapy exercises can help improve knee mobility and strengthen the muscles of the leg. Ankle exercises may also help remove excess fluid from the leg and decrease the chance of developing blood clots following total knee replacement surgery. The majority of patients are able to return home 4-7 days following total knee arthroplasty. Routine check-ups are required following knee arthroplasty to ensure that you heal properly. Full recovery from knee arthroplasty may take 6-12 months. Following your release from the hospital, at-home physical therapy sessions may begin. These physical therapy sessions are meant to ensure that you do not damage your healing knee while at home. It is important to use your walker or crutches as frequently as suggested by your physical therapist. Placing your full weight on your leg before suggested by your physical therapist may damage or injure your knee. Strength exercises will be introduced to help improve the control of the hip, thigh, calf, and buttock muscles. Increasing the endurance of these muscles may be achieved through swimming or cycling. These exercises should only be started once cleared by a professional. As your physical therapy sessions end, your physical therapist will also add in exercises that mimic daily activities to prepare you to return to your everyday life. Your physical therapist may also give you a list of exercises you can perform on your own to strengthen the knee and leg further and to reduce any pain if discomfort returns. How can I learn more about knee replacement surgery? To learn more about a knee replacement, please request an appointment online or call Dr. Rozbruch’s orthopedic office in NYC at 212-744-9857. Prior to an office visit, please fill out Dr. Rozbruch’s patient forms to expedite your first visit.